Charity Mission: Works to provide those diagnosed with cancer, their families and loved ones access to mental health therapy and family support. Running a successful nonprofit bears many striking similarities to running a successful for-profit enterprise. In both environments, there must be a balance between revenue and expenses, goals and objectives need to be defined, and a team of individuals needs to be motivated and organized to achieve those goals. To have a sustained impact, both nonprofits and for-profits must develop a strategic vision and use relevant goals and metrics to help secure successful results. 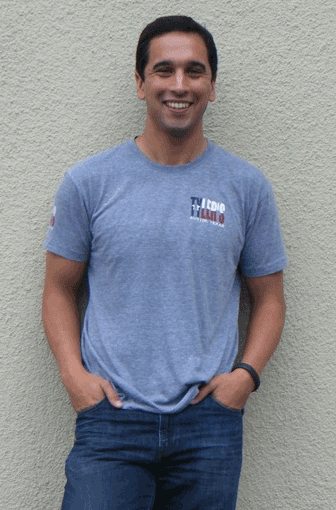 We talked to Mark Garza, Founder and Executive Director of the Flatwater Foundation, about how he approaches running his nonprofit as a business, why it’s important to find a balance between organization and passion, and how he’s been working on building the ultimate staff. Can you give a brief description of the Flatwater Foundation? The Flatwater Foundation focuses on the mental health aspect of a cancer diagnosis. So many people are affected by a diagnosis; it’s our mission to focus on helping survivors, their families, friends and loved ones stay united. In other words, we aim to help them overcome the diagnosis and remain strong: mentally and physically. We have witnessed the way that a cancer diagnosis can cause incredible turbulence in the lives of the people it affects. The Flatwater Foundation looks to bring impacted families and communities back to the serenity of navigating flat water. This imagery guides our mission. We try to achieve this by breaking down the stigmas people have around getting help, seeing a therapist, and getting mentally fit. Austin is a great place for fitness minded people, so we also encourage the idea that “fit-of-mind” and “fit-of-body” are one in the same. Both components are vital to living a healthy life. As executive director, how do you approach your nonprofit organization as a business? Our organization looks to not only stay as organized as possible, as any business should, but also to remember how important it always is to stay on track with our mission. We are constantly evaluating the tasks at hand and our goals as an organization, with the ultimate objective of staying true to our vision. The Flatwater Foundation was created for the same fundamental reason that entrepreneurs create new companies: I discovered a hole and decided to fill it. When my father was diagnosed with Stage IV cancer I felt firsthand the impact of a diagnosis. I immediately found myself seeking support. As I was about to attempt to get counseling for myself, I was made aware of the costs and had an initial moment of shock. The care was going to be very expensive and my insurance company was not going to help. After analyzing the landscape in my hometown, I quickly realized that there was a lack support for the thousands of other people that were experiencing the same thing I was. This scared me. Recognizing the problem, I set out to get the ear of one of the strongest organizations that was already working in my community to identify those in need and help provide some level of care, LIVESTRONG. We were able to work together to create a process for getting longer-term help for families in need. I had identified the hole, and filled it. The money raised by The Flatwater Foundation pays for 100% of the care provided to our referrals. Utilizing a group of referral agencies (existing nonprofits & cancer organizations) that identify the need for care, we match our referrals with our small network of providers. We are working hard to close the gap that exists for the giant number of people in need of support that simply don’t have the financial means to gain access to care. Many nonprofits are run by individuals that also work full-time jobs, and run the nonprofit on their spare time or after hours. How do you think this affects the efficiency or success of an organization? It’s definitely difficult, especially because of the strong push to keep overhead low. Many nonprofits are operated by people that volunteer their time and work after-hours to make it all work. I think it’s important to find passionate individuals with pure intentions that clearly represent your organization’s goals. If an individual’s mindset matches that of your organization, the success will hopefully follow naturally. To make sure our organization is sustainable, we have decided that our care providers (counselors, therapists and practitioners, etc.) will always be paid for their time, on a sliding scale. This allows us to make sure that our candidates are getting top-notch care. Our program costs consist of monies paid to our providers for each hour of billable time they spend with a survivor, a family member, an entire family, etc. We raise money to pay for this care. The wonderful part is that we are able to negotiate rates with our providers. Many of them are survivors themselves and offer us rates as low as half-scale. This means that we are able to turn a $10 donation into $20 worth of care! What have you learned about making business decisions for your nonprofit? I’ve found that one of the biggest jobs of an Executive Director is the task of identifying the intentions of others looking to work with your group. From the Board of Directors, to the care providers we partner with, to the sponsors of our events, we are constantly evaluating how the different things we do serve our mission. Will it allow us to stay on task? And are the intentions of all involved beneficial to the nonprofit as a whole? Keeping these in mind and working towards a common goal has helped us stay on track. To other nonprofits looking for advice, I recommend organizing the strongest Board of Directors that you can. Seek out individuals that share your passion and understand your goals. Study other nonprofits, learn from failures, and strive for success. Eat, sleep, breathe, and live your cause. Tell us about your big fundraising event, Dam That Cancer. Dam That Cancer has been such a surprise breakout. The initial paddle in 2010 was thrown together by me as a PR stunt to get on the air and tell as many people as possible about how important mental heath and exercise were for me when I was coping with my Dad’s diagnosis. For me, it was meditative to paddle board on the Colorado River. 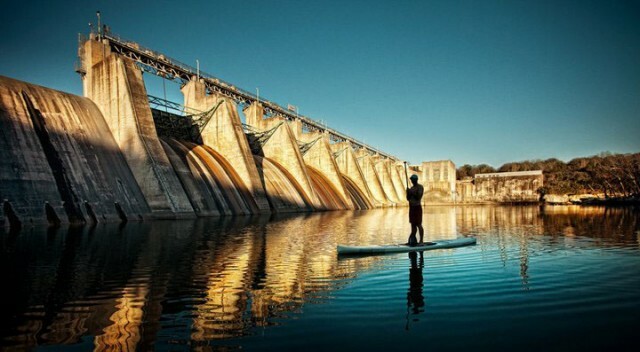 So I thought, why not make a big stunt out of what I’ve been doing normally and paddle from dam to dam. I called it Dam That Cancer and reached out to local TV and Radio contacts to spread my message. This quickly turned into something that the community got behind and 16 people came out to paddle with me. We even got a local Morning Radio show (Mix94.7, JB and Sandy, a top show in Austin) to do a live broadcast from a boat on the water while we paddled! What started out as a stunt ultimately led to over $30,000 being raised for LIVESTRONG, which is now our partner organization. After the event, we realized the need for our own programs so I headed to the state offices to register us as an official nonprofit organization. Today, we are working hard to move away from being viewed as just an event and we’re focusing on branding our Foundation as the cause. We have enjoyed success getting the word out about our event, but we always keep in mind that the most important thing is providing care. 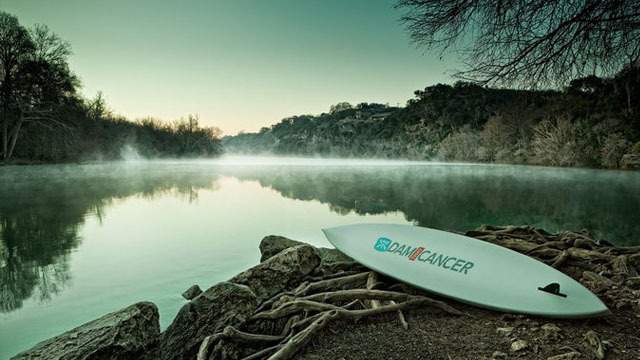 The event enables us to provide that care, but we want our donors to know that we are not the Dam That Cancer Foundation, we are The Flatwater Foundation. At the end of the day, we wanted to be different, to be new, to be bold, and to create an event that was unlike anything else in our town. 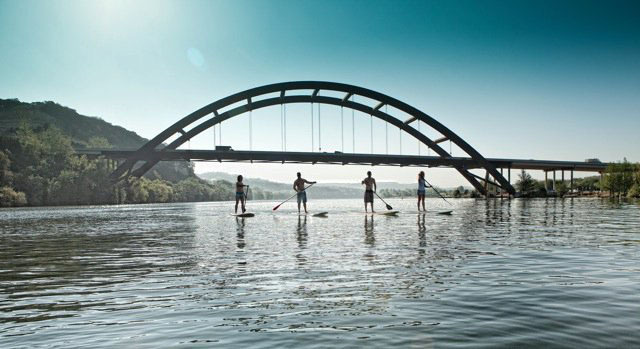 With a 21-mile journey on paddleboards, I think we have done that and people have taken notice. [toggle_framed title=”Learn More About The Flatwater Foundation”]The Flatwater Foundation is an Austin-based nonprofit dedicated to providing those in the community diagnosed with cancer, as well as their families and loved ones, access to therapy and physical activities to improve their mental health.